Canadian Wildlife Federation: Q. I often see coyotes on my evening walks. Should I avoid eye contact? Q. I often see coyotes on my evening walks. Should I avoid eye contact? A. 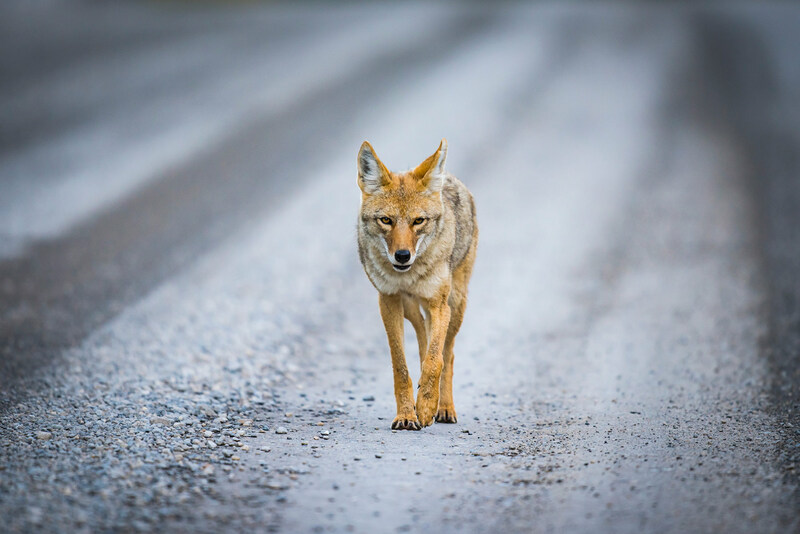 Curious and timid, coyotes can be seen crossing roads, parks, even backyards. While some coyotes may take off at the first sight of you, others may be a bit more curious and stop and stare, maybe even approach. One of the easiest things you can do is to make yourself as big as possible and make some noise. Stand tall, wave your arms in the air, wave your jacket above your head, clap your hands and start yelling at the coyote to leave. You can also use a whistle, air horn or bells to make noise. Even if it’s sunny you may want to bring along an umbrella! The opening and closing of an umbrella is said to scare coyotes away. If it’s dark, shine a flashlight towards them. Slowly back away from the coyote. If the coyote still hasn’t left, you can throw some small stones, sticks, or something else that is near you towards the coyote. But let’s be clear - throw the object towards the coyote, but do NOT hit the coyote and injure it. If the coyote runs off a bit then stops and stares again, continue with the above actions until the coyote has left. If you are walking a dog, make sure they are on a leash so they can be kept in control if a coyote is near. Small dogs can be viewed as prey, while larger dogs can be regarded as a threat. If you are walking a small dog, pick the dog up. For larger dogs, make sure to pull them in close to you. But there is an exception! If the coyote is sick, injured or has pups, avoid all the above and exclusively back away while keeping eye contact. Don’t turn your back or run away as this may trigger the coyote to chase you. If coyotes are known to be in the area, avoid walking in the early morning and late evening. Do not feed coyotes as you don’t want them to lose their natural fear of people. This includes keeping compost, garbage and recycling bins secure, picking up any fallen fruit and storing pet food inside. The coyote is capable of reaching up to what speed while running?